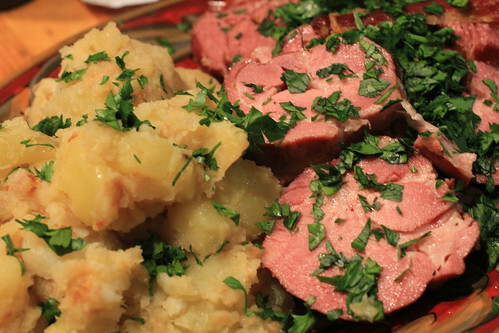 Food from this little Grand Duchy bordering Belgium, France, and Germany is for sure Germanic, with pork and potatoes, but also with a surprisingly strong showing from fresh beans. It’s also one of the most northerly wine-growing areas in Europe — just about all of which is white — and we Noshers bring our A-game when wine is culturally appropriate. 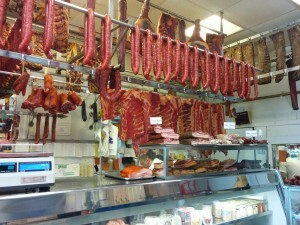 Or preserved meats. For a relatively simple meal from a little country, Luxembourg turned out to be a big occasion! It was our first Nosh in Brooklyn since moving nine months ago, and a nice round Meal 100 to boot. Michael and China were super-generous in hosting us in (and renting a second table for!) 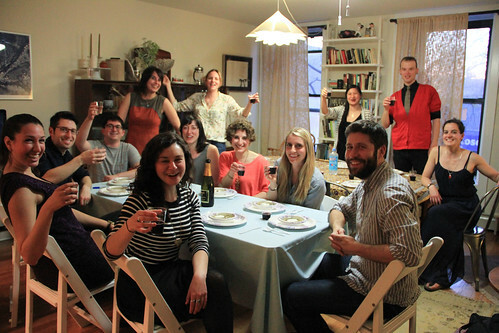 their ample Park Slope apartment, so we had a grand crowd of 16 for really fun evening with friends old and new. And I really enjoyed heading back up to Astoria to do the shopping. Among the attendees were our friends Jessica, Miriam, Lisa, Kirsty, Anna, Eli, and Sarah-Doe! 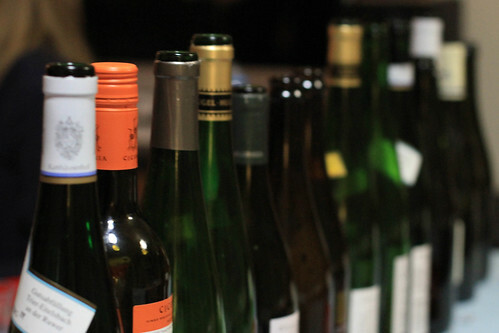 The wines of Luxembourg are similar varieties to those grown in the adjacent German Mosel and French Alsace regions: Müller-Thurgau and Auxerrois (very similar to Chardonnay) top the list, along with pinot gris and riesling. Alas, we couldn’t find any wines from the Grand Duchy, so we substituted with said neighbors. Generously. If schlupp isn’t an onomatopoeia for the slurping of soup, I’d be shocked! 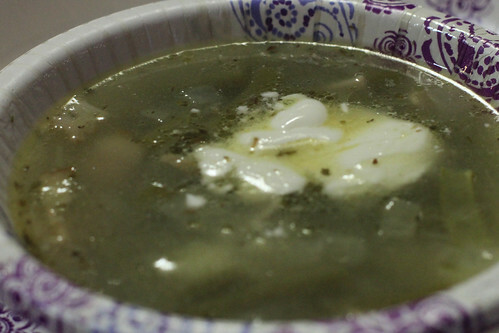 Don’t be fooled by the simple recipe and lack of a stock, or dismayed at how long the green beans are simmered. 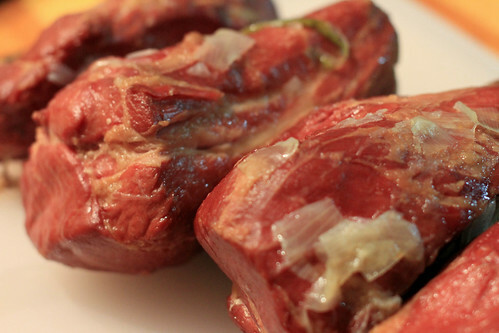 Instead, focus on how you start by sautéing bacon in butter as an indication of this being a recipe 100% devoted to flavor.This is one rich, delightful soup, where every ingredient’s flavors shine through. Accordingly, make sure you’ve got what it calls for, particularly with smoked bacon and dried savory. Maybe you could make a good soup with unsmoked bacon or some other choice of herbs, but I doubt it’d have the particular richness of flavor we enjoyed. While this is given as one recipe, it’s really three dishes, all held together by a common ingredient: salty, smoky, meaty stock. That’s all it takes to make the pork; the rest is just taking that broth and using it to make the other parts really yummy. 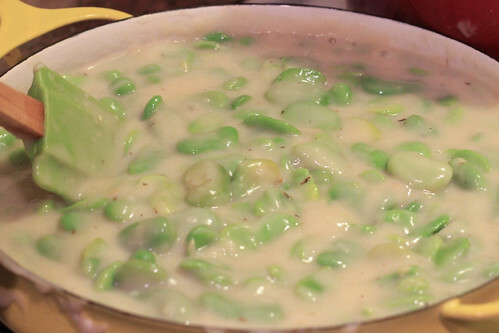 Fava (aka broad) beans trade one enrobing for another: peel-blanch-peel those notoriously well-protected beans, then smother them in a velouté made of roux, white wine, and some of that pork broth. Yum! Pork so tender that it succumbs to a plastic knife, potatoes at just the right texture to be speared with a plastic fork (you’re getting the idea of what we ate with!) without falling apart, and creamy-salty sauce balanced by fresh-firm favas. 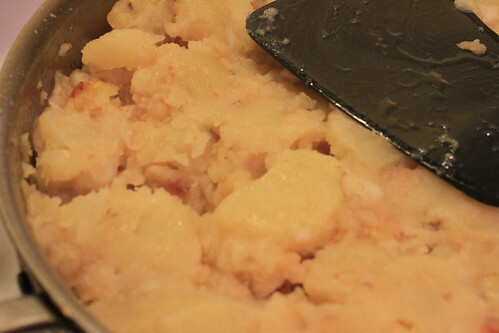 Luxembourg, your national dish may be oddly specific, but you figured out a darn good thing. A quetsch is a damson plum, a tart variety best cooked into jam or pie. It’s also only available in the fall, and not exactly the sort of thing that’s popular enough to be shipped fresh from the Southern Hemisphere, so I had to get creative. One market I stopped into had both regular ripe plums (thanks, Chile!) as well as the sort of sour plums used to make those weird and wonderful Japanese preserves (who knows where they came from), so I got some of both in a vague hope that the combination would resemble a quetsch. I’m not sure if I was successful in attempting the original with that combination, but it was tasty! 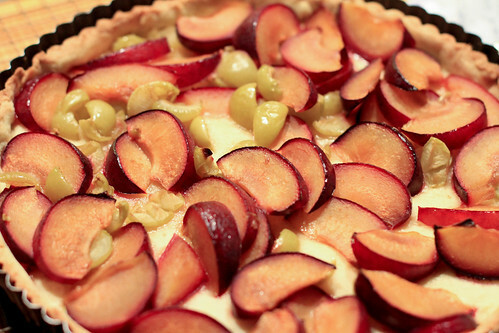 China played the role of pastry chef, working together a really nice and solid crust. I think the egg in there helped. It’s an extremely simple recipe, but with a little whipped cream I think it turned out just fine. If I ever see damson plums at the market, I’m now intrigued enough to try making something with them. Big thanks again to Michael and China for being so generous in so many ways for this special occasion, our 100th Nosh and return to New York! This feast couldn’t have happened without you.